Mike's Limousine would like to introduce our NEW DOUBLE DECKER BUS, this is a one of a kind transportation giant. This mega bus seats 82 passengers and has all the comforts you would expect in a luxury motorcoach. This premier double decker bus can transport a large group economically and efficiently. Imagine traveling from Tallahassee to your destination in comfort and style, with a magnificent view from this double decker one of a kind motorcoach. Available starting October 15th, call 850-251-6453 for details. Our newest Deluxe 36 Passenger MCI F3500 Motor Coaches... perfect for small group transportation. Our top-of-the-line motor coach has DVD, 4TVs, stereo, large viewing windows, leg room, ample cargo room, rest room... full-size coach comfort at a lesser cost. 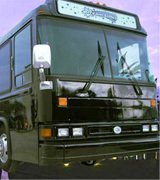 Rent a charter bus in Tallahassee. We service North Florida, Georgia, Alabama and are within just hours from our home offices. Jacksonville, Orlando, Tampa, Miami, Atlanta and Birmingham are quick driving destinations for our bus charter service. 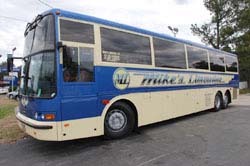 Mike's Limousine Service - Tallahassee Motor Coach has a variety of ground transportation options including our large 58 passenger Prevost executive motor coach with leather wrap around headrests, tvs, sound system, charter buses, busses, motorcoaches, custom busses and limo buses. Mike's Limousine Service is the best way to travel. We offer a wide range of motor coaches and busses for charter, group travel and ground transportation. We have a fleet for regional transportation, Tallahassee charter service, or we can take you across the country or to a destination of your choice. We have new top of the line motor coaches equipped with the latest comfort, entertainment and technology to ensure an enjoyable trip. 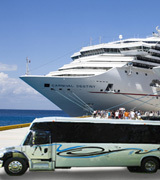 A charter bus is a great way to get a group to your destination. 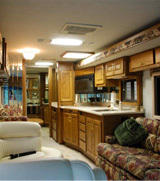 You can have all the comforts a custom motor coach has to offer. We have flat screen TVs, sound and lighting systems, and large comfortable seating. Some busses hold up to 66 passengers. Our midsize Ameritrans M2 Mercedes Benz charter bus is state of the art with all the trimmings and holds up to 36 passengers with TVs, footrests and reclining seats. Going on a cruise? Let us take you and/or pick you up from the terminal for a no worry vacation. Award Winner - 4 years running!